Toasting brings out the hazelnut flavour. I’ve been investigating nut liqueurs lately and decided that this one would be my first foray into the genre. I have others planned for future. Hazelnuts are exactly what they sound like – the seed of the hazel tree. We often call them “filberts” as well. Hazelnuts and their extracts are used extensively in confectioneries and as flavouring in many products, such as Nutella. 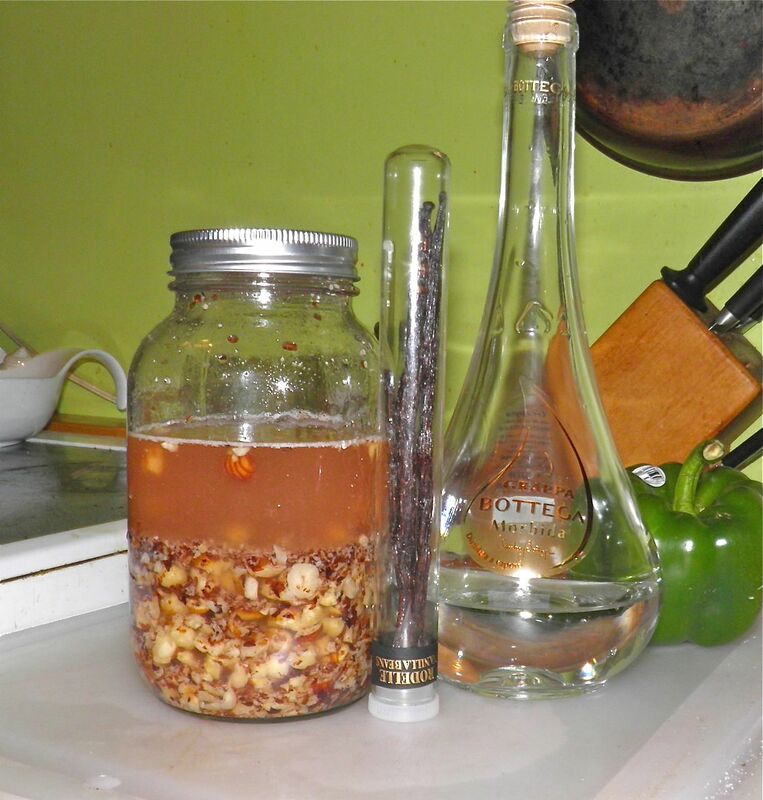 Hazelnut oil, squeezed from the nuts, is quite strong and quite expensive. 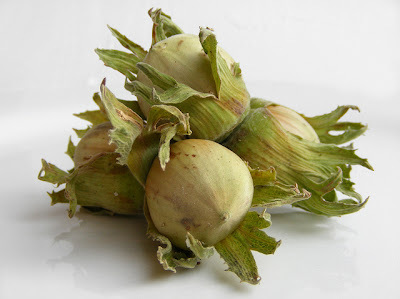 Hazelnuts are rich in protein, unsaturated fat and B vitamins. I do not know if the infusion process extracts any of the vitamins or minerals from the nuts. I doubt it. 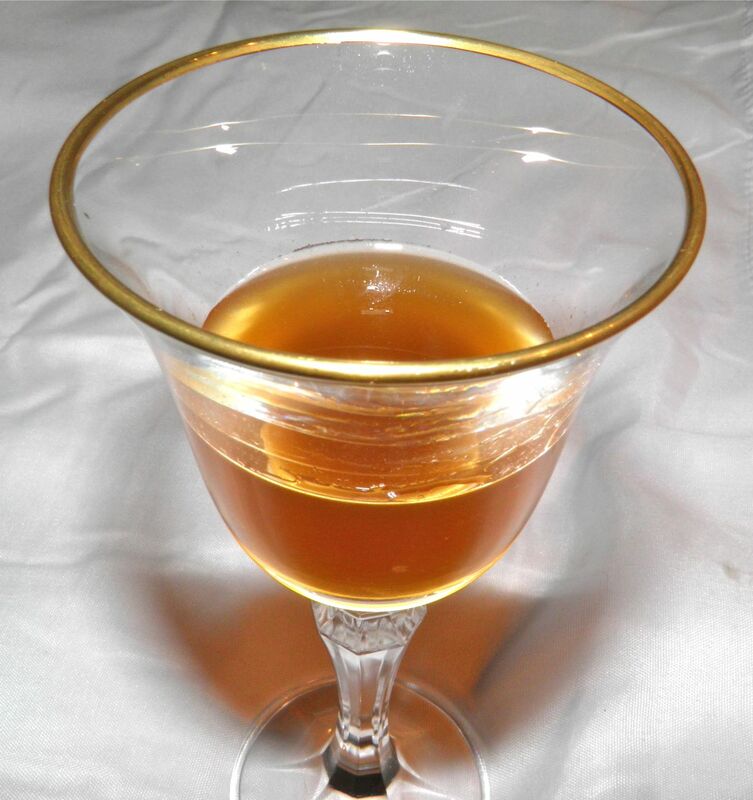 One of the most famous liqueurs made from hazelnuts is Frangelico, which has been produced only since the 1980s. It is currently being made by Gruppo Campari. It is used in Hazelnut martinis, a Hazelnut Cranberry mixed drink and others, as well as in cookery as a flavouring. I can’t see why this liqueur couldn’t be used in its place. This is NOT an imitation Frangelico. Homemade Frangelico recipes do exist, but the quantity of vanilla in mine makes this a blend of the two flavours. After chopping the toasted hazelnuts you can smell the fragrance that will be infused into the grappa for the final result. Add in your mind the scent of vanilla and you’ve got an idea of what this liqueur is like. By the way, I purchased my hazelnuts at the bulk food stores. Ensure when you buy any nuts you check the ingredients list. Believe it or not, besides salt, many nuts have soy oil added when they're processed. Look for "dry roasted" which has neither. Two notes: First, strain the infused liquid through a fine cloth at least three times. Second, squeeze the nuts in the cloth as hard as you can to extract as much hazelnut flavour as possible. You will still find your end result is a bit cloudy due to the breakdown of the skins. Not to worry—it doesn’t hurt the flavour at all! 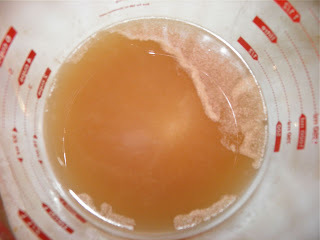 The strained infusion after one month. 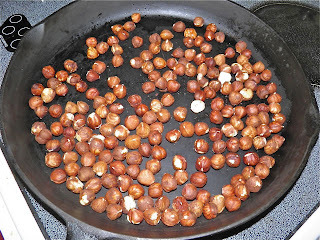 Place the hazelnuts in a frying pan and toast for a few minutes. Do not allow to scorch. Keep them moving in the pan either by shaking or stirring. They will become fragrant and just start to smoke when ready. Coarsely chop the toasted nuts in a food processor until they are in medium sized chunks. Put them in a 1 L Mason jar or other container with a tight fitting lid. 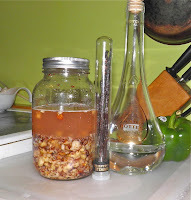 Pour the grappa over the top, seal and let steep for 4 weeks. After the month, strain out the nuts, vanilla and pieces of skin from the infusion using a piece of muslim cotton cloth. Combine the sugar, water and vanilla bean in a saucepan. Bring to a boil and let boil for 5 minutes. Remove from the heat and let cool. Remove the vanilla and add the syrup to the nut infusion and stir.